When in New Orleans, a trip to Cafe du Monde is a must. While Cafe du Monde has a number of locations these days - and not that I've been to many of them - but I love the original shop that has been in the French Quarter in 1862. It is open around the clock, with open air seating underneath a giant green canopy. 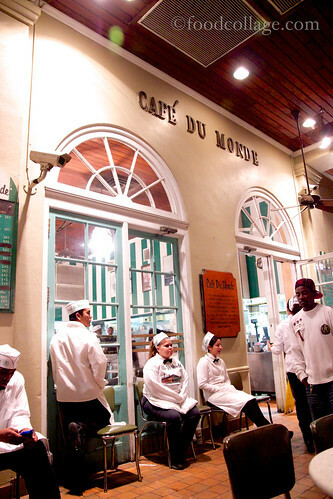 Cafe du Monde is known for its Beignets and Cafe au Lait, of course. The cafe au lait is a dark roast coffee with chicory, added to take the edge off the bitterness, and mixed with milk (1/2 coffee, 1/2 milk). Even though I am not much of a coffee drinker, I was in love with Cafe du Monde's cafe au lait - probably because it isn't bitter! 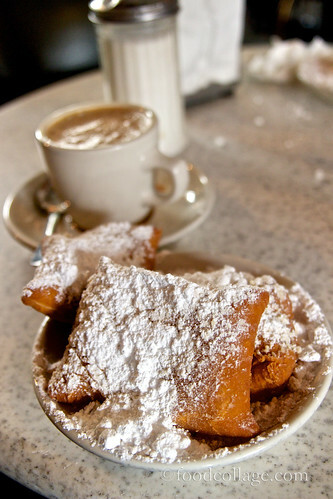 Like coffee and chicory, beignets were brought to Louisiana by the Acadians (or Cajuns) - French colonists from Eastern Canada who had resettled down south. The beignets are deep fried donuts topped with powdered sugar. They come in threes, and they are amazing. 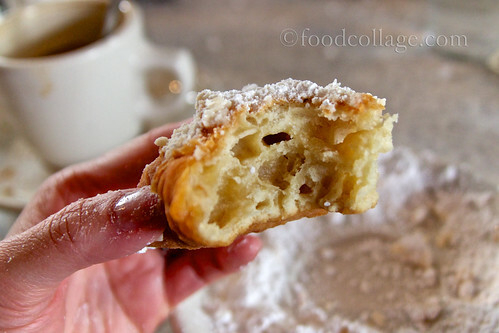 I am not a donut fan either, but it is hard to beat freshly made beignets. Just be careful not to wear black while enjoying your beignets!